I don’t know about you. But I forget stories all the time. I can be so engrossed in a good novel that I regret finishing it. Why isn’t there a sequel?!?? Yet, one or two days later, enthralled by the next story, I’ve forgotten the previous story already—no matter how much I loved it. But last month I read something different. It’s now several weeks later, and the story still hums around in my mind. Why did I remember that one story? The Map of Us is a novel by Jules Preston, describing several generations of one family. She would paint a map of the Great Moor on the walls. She would add the details as she went. Then she would never be lost again. When I was four or five I was allowed into my grandmother’s study for the first time. I saw the painted walls. The map of the Great Moor. From floor to ceiling. Around the window. Over the fireplace. The land of Arthur Galbraith. I would often stand in the doorway and stare. Sometimes I still do. I found Abby standing in the doorway of Violet’s study. She was staring at the painted walls as two generations of the North family had done before her. I watched as she explored the map of Arthur Galbraith’s Great Moor. Violet’s act of wild invention. Bishop’s Top, then northwest to New Mountsley Yard on the ceiling. Peddlar’s Oven to Nine Ways End by the window. Hallberry Bridge across to Tin Gate Mire above the fire. The gap yet to be filled by the bookcase. Only the rough outline of a river and a fording place and a ring of standing stones awaiting a name and a history. The idea of the map is so vivid in the story, I keep thinking about it. The map is not prominent in the book. It’s only a small detail. Its first mention is half-way, and it appears only a handful of times—in a full-length novel. But the map is vivid. Plus it has a deeper meaning. It’s a symbol of the connection between the generations of a family; they all travel through the same landscape, in their own ways. The gleaming detail is the one thing that captures both the emotion and idea of the story at once, in one fell swoop. A singular, elegant moment of clarity. It is a literal representation of the truth that is inherent within every story. So as you develop your story, ask yourself: what is the truth within the story that I want to tell? Buster tells the story of DJ Forza who travels to Japan as a volunteer after the tsunami and nuclear disaster in 2011. This is why my mother wanted to make tea for you. She could not believe that an American would come all this way to help us. This is the moment that Forza realizes the power of citizen’s diplomacy—the key message in her story. The cup of tea is the powerful symbol of human connections between former enemies. A symbol of peace. As Chip and Dan Heath explain in their book The Power of Moments, great customer service experience—an experience worth raving about—is not defined by the average of the whole experience but by the remarkable moments in that experience. Remarkable moments are often surprising, memorable and meaningful. Chip and Dan Heath give the example of an average hotel—“The lobby is vaguely reminiscent of an auto service shop waiting area”—which has a Popsicle Hotline, a cherry-red phone next to the swimming pool. You can pick up the phone, order a Popsicle, and it gets delivered to you at poolside, free of charge. I read The Power of Moments a year ago. I’ve forgotten most books I’ve read since. But I still remember that red phone and the Popsicles, and how they symbolize remarkable customer service. What does your business stand for? And which gleaming detail could symbolize your story? Lately, I’ve been thinking a lot about maps. About how some people can plot their business path years in advance. They know exactly who they want to target and what they want to offer. It’s almost like a Soviet-style five-year plan. For me, it’s been different. My forward visibility seems only a few months. Most of my map is still blank. I walk ahead, curious to find out what’s beyond the next bend. I’m not even sure I’ve found the gleaming detail in my business story yet. With her purple hair and big pointy nose, Henrietta seems memorable. And she feels like a symbol of discovering my voice—in writing, in drawing, and in business. A symbol of doing things my way, and sticking to my personal values. The links below are Amazon affiliate links. Business Maps! I have been thinking more and more about this recently. Thanks for another interesting read! I really think it’s a personal choice how far ahead you want to work and how detailed you’d like your plan to be. I prefer doing to planning, so I keep my plans to a minimum but always have an idea of where I’m heading and what my priority is. Thank you, Henneke. Your work is SO helpful! And, Henrietta’s musings—memorable, indeed! I’ll be looking for the “gleaming detail(s)” from here on out! Thank you so much for your lovely comment, Raquel. Here’s to discovering more gleaming details! I so love your writing and your wisdom, Henneke, and would very much like to feature you and your Enchanting Copywriting course on my Business of Story podcast. We are among the world’s top 10 percent of downloaded shows and our listeners would welcome getting to know you and your work. What do you say? Will you please join me for an episode? Hi Park — I appreciate your invitation and I’d love to have time for fun things like that, but I’m still focusing on business essentials only. I hope to have more time later in the year, but it depends on my health, too. So – I would be curious indeed to know what your remarkable story is. Yet I also wonder if real people and businesses can have such stories. Because a novel is a construction and a through line can be construed. But a person is a person with may be way too many facets. I don’t know. Just thinking out loud. Even with a person, I think it’s about the key message you want to communicate, so you focus on one aspect. Like with Forza’s story, she believed strongly in citizen’s diplomacy and the cup of tea with the former Japanese soldier was a symbol for that. This is the emotional moment she wanted to share. I don’t think the story has to be remarkable in the sense of being extraordinary or heroic, but it needs to be emotional and connect with your audience. Then the detail symbolizes that. For me, what I strongly believe in is that we all have ideas and stories to share, and I’d like to more people to find their voice to share their stories and ideas. I don’t know what detail would symbolize that. PS I also think that a lot of fiction, especially crime novels, miss a gleaming detail. They’re written for entertainment and in such a way that you want to read the next book in the series. Connection with the protagonist is more important than remembering the story line. True. No one says you NEED a gleaming detail or a moment where the truth of truths comes to the surface 😉 Cheap novels may have such a moment too, yet it may feel like an obligatory exercise, if you know what I mean. John Green is excellent at such things. Have you read any of his young adult books? The fault in our stars? I want to write about how he uses metaphors, sometime, he is absolutely great at them. Witty, lighthearted, playful. Yet serious. He has an interesting background too, as a very early vlogger. I’ve not read any of John Green’s books. It sounds like a great recommendation, so I’ve added him to my reading list. Thanks! I found your blog a year ago. I am glad that I did. Otherwise I would be missing some of the most valuable and beautiful stories available on the internet. Thank you so much for your emails and posts. Thank you for your lovely compliment, Himanshu. Thank you for stopping by. I think your gleaming detail is how well you write about tiny topics! These sparkles are your words. Interestingly, I had initially written it as five-year plan. For some reason, I decided to change it, without checking it. I’ll go back to the five-year plan. Thank you! I read One Hundred Years of Solitude years and years ago, long before I was interested in writing. I’d love to reread it and see what I make of it now. I remember I loved it when I first read it. I think your illustrations are part of your gleaming detail but so is your voice. You always use such unusual but concrete examples that I can’t fail to know exactly what you mean! Thank you for your lovely compliment, LJ. I love hunting for good examples! I love drawing maps for my clients. It helps me think. Drawing helps me think, too. I’ve not drawn a lot of maps. Maybe I should try! Oooooh, I just got chills. I love this technique! I’m so caught up in talking about overarching themes, I’ve missed opportunities to share and talk about and focus on these small yet massively significant details that capture our imagination and secure our memories for long after the journey has ended. Your post reminds me of “A walk to remember” by Nicholas Sparks. While writing this, I still remember many vivid scenes from that book. It’s an example of using words to print on human memory. 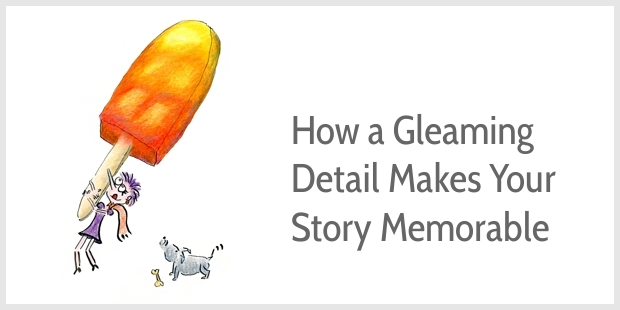 Of course, memorable stories take more hard work. But it’s usually worth it as it creates enduring stories for a long time. Thanks for the post. Isn’t amazing how vividly we can remember scenes from a book? Sounds like a good one! survived winter, it sounded like an “extra special” with cold and snow everywhere up in your half of the world. Many thanks again keeping in touch 🙂 <3 🙂 A. The weather has started warming up a little here this week. I can’t wait for Spring to arrive! Thanks Henneke for the great article! I am not looking to get into fiction or novel writing; but storytelling is an important skill in any style of writing. This is something I’ve realized; as a writer, I must be able to tell a story, and engage someone’s imagination to communicate ideas and facts. Even science. Thank you for helping with great advice! I’m not into fiction or novel writing either, but as business and science writers we can learn a lot from good fiction writing. Business writing tends to be a lot more boring, so I like to borrow techniques from fiction to improve non-fiction writing. Thank you for stopping by, Kevin. I appreciate it. That gleaming detail is exactly what makes us remember stories, Henneke. I still see visuals of some books decades after the initial reading. All about carrying that truthful, focused intent, as an author. Excellent post. I have been following your blog since past two months. Discovering your blog was like discovering an island. Every new page I reach, I find something new and exciting. Sometimes I come face to face with demons I would rather run away from ( my personal writing mistakes) but everything you write is just perfect. Nothing extra, or unwanted. What I absolutely love about your blog ( more than your enchanting writing) is Henrietta! She feels as real as you and even more fun. You really know your thing! Thanks for writing such inspiring yet practical posts. Thank you for your lovely comment. You put a smile on my face. Roadmaps and plans are very much part of what I do, so I’m always either creating plans or helping my clients tweak theirs but there’s a lot to be said about not knowing exactly where you’ll be six months from now (unless you’re an organization – then you’re in trouble). We should always leave a little room (or a blank wall? 😉) for alternate routes and inspiration. Love this post, Henneke! I find it really interesting how different people seem to have different tolerances for uncertainty (and therefore are more, or less, inclined to plan). Despite having worked as project manager for several years in my corporate career, I find that I actually don’t like planning my own business in much detail. I’m better with a more intuitive approach. I also love the idea of drawing an (imaginary) map on a wall. Maps are so fascinating! I think sometimes a story may have two such moments? I’m trying to think of great classics we could discuss this way, and I recall a moment in Little Women, when the mother returns exhausted, from trying to help the poor, and the daughters have various reactions to her works. That sticks in my mind as representative of the entire series, how she constantly was giving of her self to the end of her strength. Then in another moment in the story, when a neighbor is mildly ill, the girls take him a pudding to help cheer and nourish him. I also remember that detail from the story and think: They were copying their mother’s self-giving ways, in their own young ways. It seemed like a good resolution to the entire tale, really, although it was not nearly the end of the book. And so very memorable to me. Interesting point about multiple moments. I think you’re right. That hotel with the free Popsicles had other memorable moments of customer service. too. I’ve only remembered the one, but I’m there were other ideas, too. I like your story of how the daughters are copying their mother’s self-giving ways. Thank you for sharing. I came across to your website a few months ago when I was looking for landing page examples for my copywriter course. The first gleaming detail that caught my attention was the brief audio in which you present yourself. Afterward, I fell in love with Henrietta; Although she is a drawing, she is more real than the photos on many websites. And the gleaming details that keeps me hooked to your emails and articles are the tips and book recommendations. I never forget the person who put me on track of a good book. In my experience, such things can need a little time to develop and at once, an idea may pop into your mind of what detail represents your business. When you know what you’re business stands for, you’re already further than most! I hope you’ll enjoy “Do Story.” If you continue to feel stuck about finding a gleaming detail, the many examples in “The Power of Moments” may give you some inspiration, too. That’s a great example of a gleaming detail—so fascinating the kimonos symbolize both power / prestige and also extreme discomfort. Thank you for sharing! loved the way you combine the fiction writing with the business writing. Looking for more blogs. Thank you for stopping by, Shweta! Again, a wonderful article. I can use this technique in my articles and blog posts. And Henrietta is you business’s special highlight. Although, your brand voice is unique, it is the charming presence of Henrietta, which keeps me engaged. Can you write a post highlighting the use of such techniques in copywriting? Do you mean a post about how to use hand-drawn images?